In my profiler, finding barycentric coordinates is apparently somewhat of a bottleneck. I am looking to make it more efficient. It follows the method in shirley, where you compute the area of the triangles formed by embedding the point P inside the triangle. This method works, but I'm looking for a more efficient one! This is effectively Cramer's rule for solving a linear system. You will not get much more efficient than this—if this is still a bottleneck (and it might be: it doesn't look like it's much different computation-wise than your current algorithm), you'll probably need to find some other place to gain a speedup. Note that a decent number of values here are independent of p—they can be cached with the triangle if necessary. Slightly faster: Precompute the denominator, and multiply instead of divide. Divisions are much more expensive than multiplications. I would use the solution that John posted, but I would use the SSS 4.2 dot intrinsic and sse rcpss intrinsic forthe divide, assuming you are ok restricting yourself to Nehalem and newer processes and limited precision. Alternatively you could compute several barycentric coordinates at once using sse or avx for a 4 or 8x speedup. You can convert your 3D problem into a 2D problem by projecting one of the axis-aligned planes and use the method proposed by user5302. This will result in exactly the same barycentric coordinates as long as you make sure your triangle does not project into a line. Best is to project to the axis-aligned plane that is as close as possible to the orientation of your triagle. This avoid co-linearity problems and ensure maximum accuracy. Secondly you can pre-compute the denominator and store it for each triangle. This saves computations afterwards. I tried to copy @NielW's code to C++, but I didn't get correct results. It was easier to read https://en.wikipedia.org/wiki/Barycentric_coordinate_system#Barycentric_coordinates_on_triangles and calculate the lambda1/2/3 as given there (no vector functions needed). 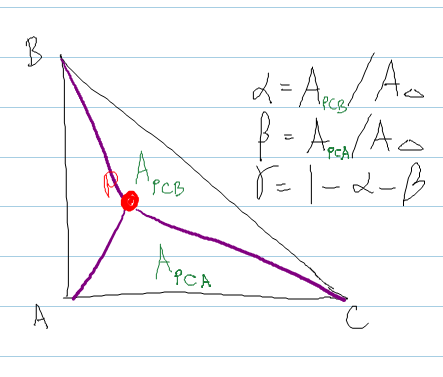 For a given point N inside triangle A B C, you can get the barycentric weight of point C by dividing the area of subtriangle A B N by the total area of triangle A B C.
Not the answer you're looking for? Browse other questions tagged barycentric-coordinates or ask your own question. Given a ray-intersect position on morphed mesh, how to compute that position at each morph target?